Giusti Portos is one of Italian companies that creates charming furniture in classic style. Probably fans of minimalism wouldn’t appreciate it, but it is impossible to refuse that this furniture is very beautiful. The luxury beds by this company amaze by their elegant shapes and opulent finishes. Almost all of them are decorated by forged elements and looks as a true art object. The most original and refine model is day bed Amaka. It presents itself as hammock with wrought iron base. It has curved base which is perfectly combined with gentle fabric canopy. These shape and materials add a fairy-tale touch to this day bed. Although this canopy bed fits only for day rest and won’t comfortable at night. However if you have enough space for two beds it will be an awesome additional to any luxury classic interior design. 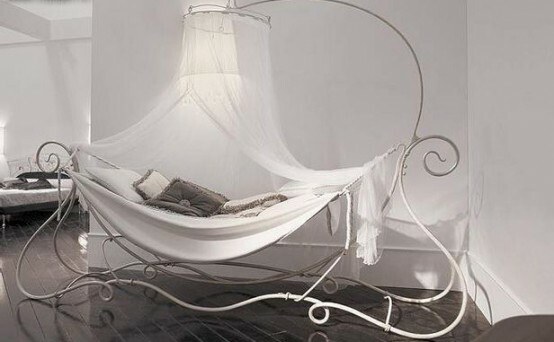 You could find more information about this iron day bed and check out other beautiful models on Giusti Portos site.